I enjoy interviews as they always force me to deeply consider my thoughts, sharpen my ability to express them, while sincerely appreciating the views of others. TVO’s The Agenda with Steve Paikin invited me to be part of a final discussing the 50th anniversary of the Confederation of Tomorrow. We discussed and debated the state of Canada now and challenges going forward. It aired on December 12, 2017. 2. CTV News called to ask my view on various leaders and their thoughts on the United Nations. As we are dealing with so many issues that transcend national boundaries, it is an interesting time to pause to consider the internationalist viewpoint that led to the creation of bodies such as the UN in the first place. 3. August 28 Interview on CBC Radio’s The Current regarding Ontario Elementary Teachers Union wanting to rename schools named after Sir John A. Macdonald. 5. CTV News July 13, 2017, on the appointment of Canada’s new governor general. 7. See how I answered this question: If you could have dinner with any Canadian prime minister who would it be? Who would you pick? Who do you think I picked? One guess! 8. Cold Fire: Kennedy’s Northern Front. Released in Canada and the US in February 2016. Cold Fire is available through Chapters, Amazon, Barnes and Noble, and bookstores everywhere. On the day of its release, it hit Amazon’s #1 as the bestselling Canadian history book. It was also a moment of existential angst in which Canadians pondered who they wished to be and the country in which they wanted to live. It was a time in which JFK exerted a powerful and not always positive influence on Canada and when Canada’s leaders at the time, John Diefenbaker, and Lester Pearson, fought for Canadian interests. D. Television Interview with Steve Paikin on TVO’s The Agenda. This is the first of two interviews on Cold Fire that were taped on February 18, 2016. Published in 2013, Blood and Daring: How Canada Fought the American Civil War and Forged a Nation was a national bestseller and listed as one of Amazon’s and the Globe and Mail’s Best Books of 2013. In 2014 it was published in paperback and in French translation with the title, Voisins et Ennemis, and was shortlisted for a Governor General’s award. R. B. Bennett was one of Canada’s most controversial prime ministers, but there had never been a major biography addressing the man, his times, and his transformational leadership. That changed in 2010 with the publication of my Bennett: The Rebel Who Challenged and Changed a Nation. The book earned critical praise and in 2012 was published in paperback by GooseLand Editions. When something strikes me as worthy of comment I write op ed articles for newspapers or include it in my Monday blog and sometimes my thoughts lead to calls for radio interviews. To contact me please email Shona Cook at Penguin Random House (scook@penguinrandomhouse.com) or use the boxes below. 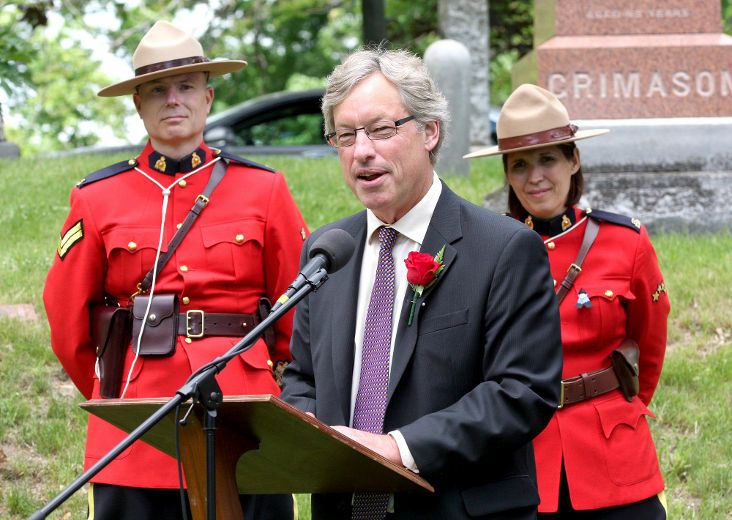 Keynote speaker at Sir John A. Macdonald’s gravesite ceremony.